we only had a big cabinet of cans and not much in the fridge. Since that night 10 years ago it has been a favorite in our home. We bring it to pot lucks and everyone raves at how good it taste. It’s very easy to make and takes about 10 minuets of preparation. 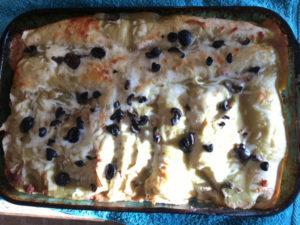 enchiladas sauce, 3/4ths cup of cheese, garlic, and spinach. cover both sides of each tortilla in half of the remaining green chili sauce. tortillas you use and how full they are packed. Spray glass pan with cooking oil spray. portion, roll and place in glass pan. Sprinkle with some olives and cheese. appear to be boiling and the cheese is golden brown.